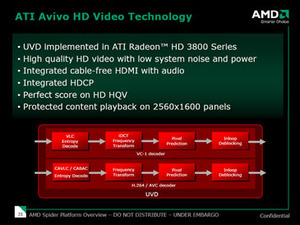 As with the Radeon HD 2000-series, the Radeon HD 3800-series features several video-orientated technologies – the first of these is the fact that all Radeon HD 3870 and Radeon HD 3850 video cards support HDCP over a dual-link DVI connection. 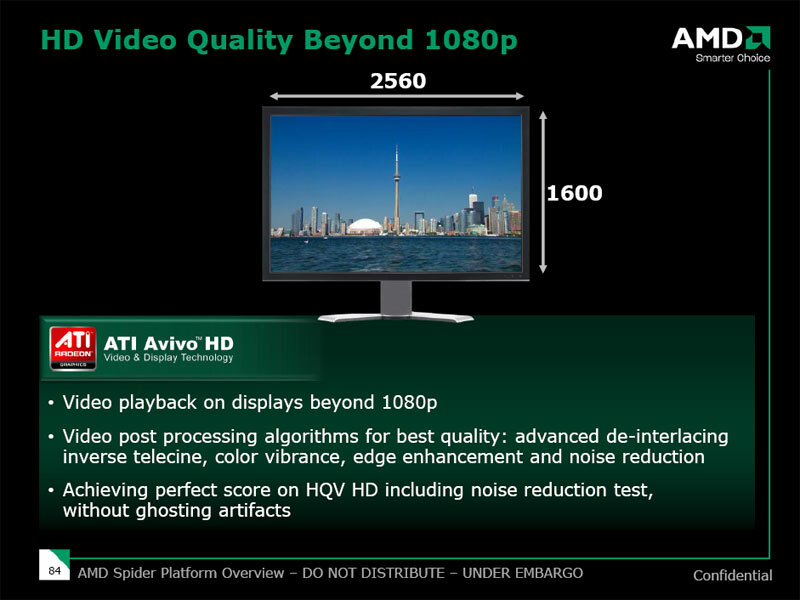 It may not seem like a big deal, but without support for HDCP over dual-link DVI, you won’t be able to watch HD video on a 30 inch monitor. Of course, this particular feature is one that Nvidia matches on its mid-range entry-level GeForce 8600- and 8500-series and also on its recently released (and truly awesome) GeForce 8800 GT 512MB, but there are other features that Nvidia’s hardware cannot match – at least, on paper. 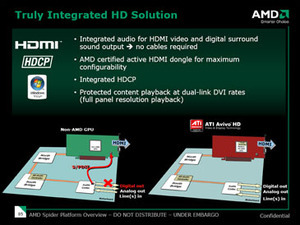 None of Nvidia’s current GPUs support audio over HDMI natively, and instead require an S/PDIF cable from motherboard to graphics card if the board partner wants to offer HDMI with audio. 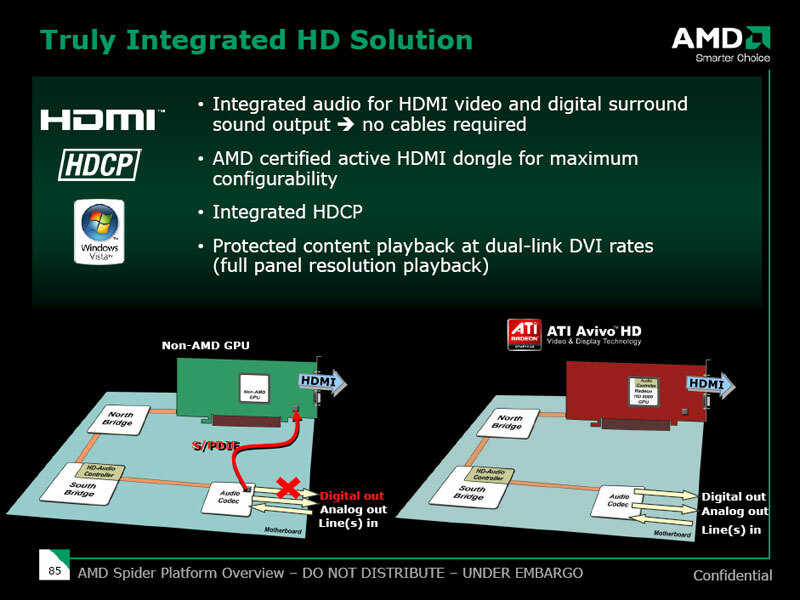 On the other hand, AMD built an audio controller into the GPU, meaning there isn’t a need for a S/PDIF cable as the audio stream is passed directly through the PCI-Express interconnect. 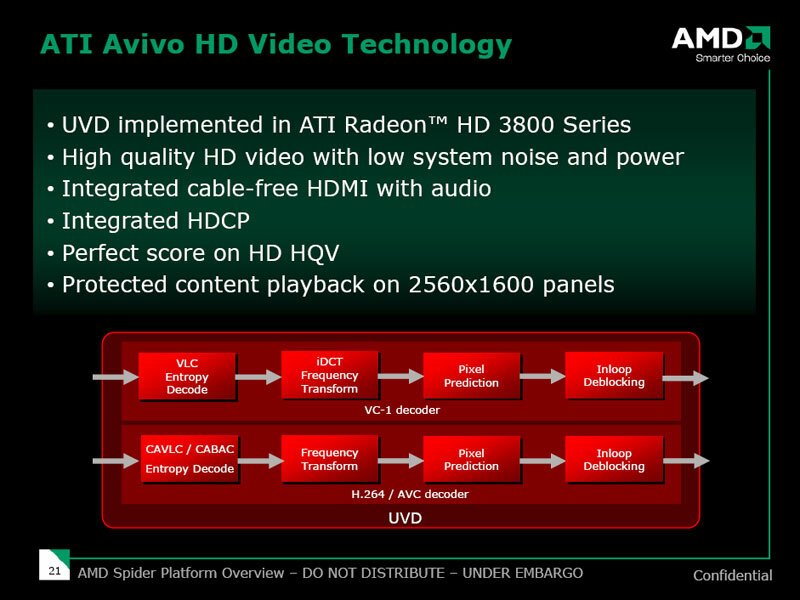 Though, probably the biggest news with RV670 on the video is the inclusion of the Unified Video Decoder engine. This was featured in both the RV630 (HD 2600-series) and RV610 (HD 2400-series) graphics processors, but despite being advertised by a number of partners, this isn't a feature on the Radeon HD 2900 XT or any other graphics cards based on R600. 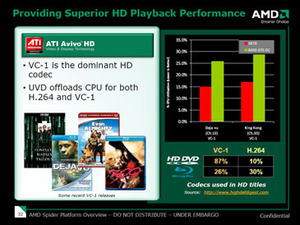 What it does is deliver full CPU offload of the entire HD video decoding process for movies encoded in either VC-1 or H.264, meaning that there is minimal CPU usage when playing back protected HD video content. 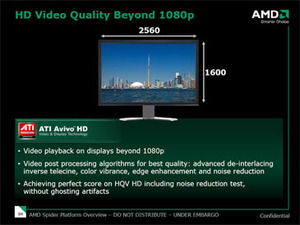 On the other hand, Nvidia improved its video decoding abilities on G84 and G86 by moving bitstream processing and AES128 decryption from the CPU to the GPU for H.264 video streams. This video processor was also rolled out onto the G92 graphics chip which is what's under the GeForce 8800 GT's heatsink. H.264 is currently by far the most resource-intensive video codec, such that even a dual-core CPU can't cope with the high bit rates H.264 content often runs at (up to 40Mbps). However, what Nvidia didn’t do was include bitstream processing and entropy decode acceleration for movies using the VC-1 codec. In other words, practically every HD DVD movie available (aside from a select few) at the time of writing isn’t completely GPU accelerated on any of Nvidia's GPUs, regardless of whether the second generation video processor is present or not. Nvidia’s reasoning for this was that the VC-1 codec isn’t as brutal as H.264 and doesn’t need as much CPU grunt to handle the bitstream processing/entropy decode stage of HD video decoding process. While that’s a fair point, it seems strange for the company not to accelerate it and to now play it down because its competitor does accelerate the process.